At the end of August, Scotland was still feeling pretty warm and summery. By the time we actually did the swim, on the 1st of October (brrr!) the leaves were starting to turn and there was a distinct Autumnal hint in the air. All of the swimmers though agreed that it was still summer until we'd done the swim. Actually getting the swim started ended up being touch and go. Our chosen week turned out to be non stop gales, and our intended support boats had to pull out at the last minute which threw all our plans into disarray. In the end we pushed our last possible day back a little, and we managed to get a small window of opportunity in the weather, and at the last minute some wonderful people stepped in with super boats and superb attitudes who came and helped make it all possible. We left from Troon on the 30th of September, some of us going with the support boats through what was still pretty much a full gale, and others on the ferry (one way ticket). We then stayed the night in a bunk house on Arran for a few hours until getting up at 03.15 to be given a lift down to Lamlash where the boats and kayaks were waiting for us. Annie and Mark, the first swimmers on each team, took to the water at 05.18 in the dark from a beach in Lamlash bay, and struck out, aiming for a conveniently sited and well-lit mast on the hill beside where Granny lives. I was swimming 2nd and was so excited as I got in the water. It had been a pretty difficult week with endless logistics, changes, doubt, worry and anxiety, so the fact that we were actually getting to do the swim was completely wonderful. It was just as well I was excited as it was amazingly cold getting in while it was still dark, but the phosphorescence made me forget the cold, it was incredible. Poor Mark had got stung by a jellyfish almost as soon as he started but kept it quiet from everyone else. Swimming in the dark was fairly surreal. We hadn't actually met the wonderful kayakers who accompanied us from the Outdoor Centre in Lamlash until we got in the water, so there was a quick chat as I started in which we introduced ourselves, and then I had my head in the sea, swimming, for most of the rest of the hour, though I was able to take in the wonderful sunrise. As I got out Katherine got in and took over, powering us along, and by the time we had rotated through Vanessa, Lorna and Alice we were doing really well, about half way across and morale was super high. The other boat which had Mark, Barbara, Bea, Whirly, Caoimhe, Joanna, and Rhona on board were also doing well so we started telling our shore teams to make sure they had the fizz on ice as we'd be home soon! Alice had victualled the boats superbly and so we ate lasagne, sang songs, swam with seals and generally had a lovely time, all buoyed with lots of lovely messages from people on the shore willing us on, and visits from our friends and family who were given lifts out on a super fast rib. Alas we reckoned without the tide which really hampered us through the second half of the day. In the late afternoon, for a couple of hours we really made no ground at all, and as the sun set it dawned on us that our hope of only doing 2 hours each was futile. I have to say I found that 3rd hour pretty difficult. I got stung by a jellyfish early on in my hour, and as it got dark it seemed to get a lot colder again, and we still didn't seem to be getting any closer. However the kayakers were superb, motivating and encouraging us all the way, and somehow I kept going for the hour. Katherine then took over and all but got us to the shore, before Vanessa did the final few hundred meters. 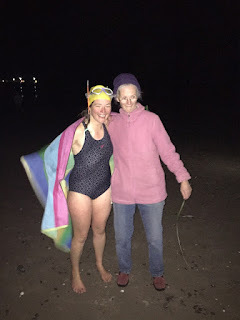 As they changed over, the rest of us got back in for one final swim and swam in behind them to finish together at just after 8.30 p.m. In the dark. What was wonderful was that both teams finished within 7 minutes of each other. The finish was incredibly moving, with many of us in tears as we waded from the sea after 15hrs 20mins 20secs of swimming, with our children, friends and relations cheering us home. It was fantastic that so many of our supporters had hung on in the dark for us to finish, and it was wonderful seeing the children still there on the beach too. After we'd staggered up the beach there was a marquee with food and drink on hand and so there was quite a party atmosphere once we'd got out of our swimsuits and it was just such a brilliant feeling to have done it. We all got involved in the swim for such varied reasons, but were all completely humbled by the support we got from so many people. I spent a lot of my time while training and on the actual day imagining how Jo would feel about it all. I definitely think she'd approve, and I like to think she'd have got involved too were she here now. Neither of us had ever been very strong swimmers (though we were always keen), so I hope she'd be proud that I've got so much better. Thank you, thank you for your kind donations, messages and offers of help, they meant an awful lot to all of us and really helped keep us going through the difficult bits. The swim generated some interest from the press and for those of you who are interested I've pasted a few links to articles below as some of them are quite fun. We also had a Facebook page for the swim which was great, and captured the spirit of the day quite well and has loads of photos, videos etc. I've also added a few photos of the day below. Thanks again for all your support, it's been an amazing venture of which to be part. Me with my mother - who doesn't look quite sure she thinks I'm warm or dry enough to hug, but is doing her best!